Most issues that patients see result from a lack of oral hygiene. Plaque and bacteria can build up around the base and in between dental implants. These buildups can cause issues with bad breath, gingivitis, and bleeding gums. These problems can be especially troubling while you are healing from a dental implant procedure. Many people believe that they should use more rigid toothbrushes. This belief may stem from the perception that a stiffer bristle has more ability to remove buildup and keep your mouth clean. However, dentists recommend using soft brushes because they are just as effective at cleaning, and they don’t cause additional gum irritation. As you brush your teeth, make sure to pay special attention to any cracks or crevices where bacteria and plaque tend to hide. If needed, you can use an interdental toothbrush. If you choose to use an interdental toothbrush, make sure that it doesn’t contain any metal. Metal can scratch the surface of your implant and can require its repair or replacement. Abrasive toothpaste and other products can wear out the enamel of your natural teeth and have a degenerative effect on your crowns. Stick with products that aren’t too harsh. Many patients don’t like the intense effects that some mint toothpaste have on their mouth sensitivities. If you are having a difficult time finding a good toothpaste, talk to our dentist to get their recommendations. Dental floss is available in man styles, colors, and flavors. Experiment to find the floss that works best for you. 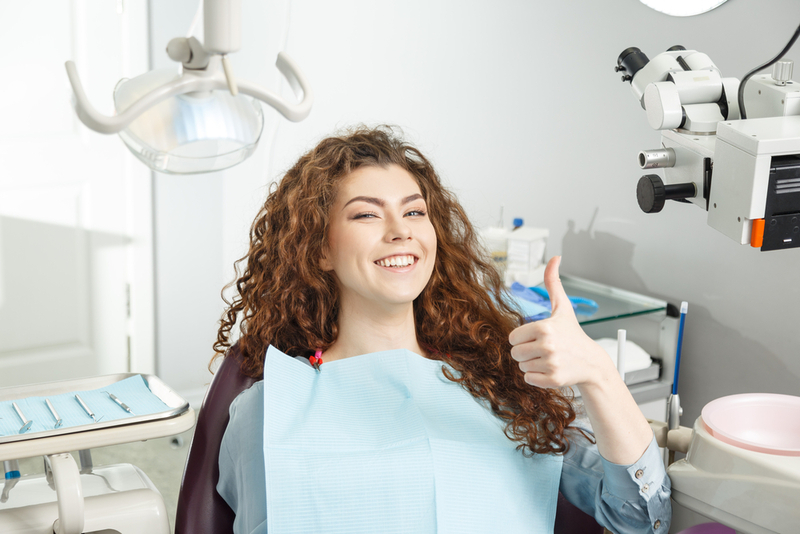 Some patients find that their usual dental floss works well with their dental implants, while others prefer flosses specifically designed for use with implants or crowns. Flossing daily helps to clear some of the debris left between teeth that brush couldn’t get. Over time, this buildup can cause gingivitis or other oral issues, so take the time to properly floss. Brushing twice daily is consistently a dentist’s top recommendation to their patients. This guidance has not changed in decades. Brushing twice daily has one of the most significant effects on a patient’s overall oral health. You should brush for two minutes with a soft nylon brush. Many patients also find that using an electric toothbrush helps to stimulate their gums and cleans their teeth better than manual brushes. Our dentist will have recommendations on the best electric toothbrushes for you to use. Oral irrigators and water flossers use targeted streams of water under pressure to help clean and rinse away any buildup that can get stuck between teeth. The use of water is gentler on the mouth and poses less risk of damaging your natural or implanted teeth. Talk to our dentist about developments in water flossers before you make your purchase. Gum stimulators are rubber tipped dental instruments that help to heal and strengthen the gums by stimulating oxygenated blood to the gum tissue. The increases in blood help to flush out any toxins and deliver a consistent flow of nutrient-rich blood to the cells in the gums. Healthy gums are a critical component in your healing process. If you are considering dental implants or have recently received dental implants, it is important to maintain proper oral health. By following a few simple guidelines, you can ensure that your mouth continues to be healthy for years to come. If you have other questions, don't hesitate to contact us and schedule an appointment with our dentist today.